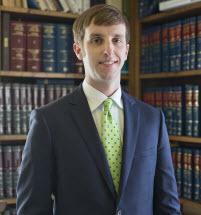 Brinson joined Hugh J. M. Jones, III, P.C. in 2018 and counsels clients primarily in the areas of residential and commercial real estate transactions, wills and estates, and business formation and counseling. In addition, Brinson also maintains a practice in personal injury, motor vehicle accidents, and lemon law. Prior to joining Hugh J. M. Jones, III, P.C., Brinson worked for a small firm in downtown Lynchburg practicing personal injury, workers’ compensation law, and lemon law. Brinson received a B.A. in History and Rhetoric from Hampden-Sydney College in 2013. While in college, he served as Vice President of his fraternity, Beta Theta Pi, and was a member of the Garnet and Grey Society, Society of 1791, and the Clay Target Club. Brinson began learning the foundation of the real estate world during his summers in college when he worked for Chicago Title Insurance Company in Charlottesville, VA as a title examiner. Brinson received a J.D. from Elon University School of Law in 2016. During law school, Brinson interned with several small firms in Charlottesville, VA and Greensboro, NC, but he spent the most time working for a prominent Charlottesville firm in the real estate section performing residential real estate closings and assisting the post-closing department. It was during this time Brinson developed the detail-oriented skills necessary in a real estate practice to effectively promote his client’s interests in a timely, accurate, and cost-effective manner. Brinson was born and raised in Charlottesville, VA and his father is still an attorney in the area. After law school, Brinson married his wife and moved to Lynchburg where they are proud to call home. When he is not promoting his client’s interests in the office, Brinson enjoys spending time with his family, friends, and black lab, Stihl. He is an avid outdoorsman and tries to spend as much time on the water or in the woods as he can.